Work is well underway to transform the historic Piece Hall and create a new, state-of-the-art Central Library and Archive in Halifax town centre. As part of this work, diggers and other heavy vehicles are accessing the site from Square Road. To keep pedestrians safe, part of the footpath alongside Square Church on Square Road has been closed for the duration of the works, until spring 2016. People are being asked to take extra care when walking in the area. Pedestrians are asked to use the pavement on the other side of the road to stay safe, and signs are in place to direct them. Alternative construction access points for the work vehicles were considered, but due to narrow roads and other constraints Square Road is the only place where they can get in and out of the site. The new Central Library and Archive is wholly funded by the Council. 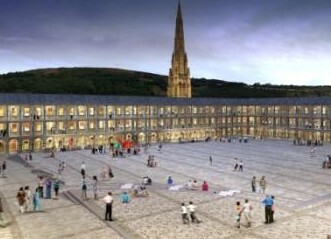 It will be a striking building which provides state-of-the-art facilities for the community, supporting the Piece Hall transformation and helping to create an improved pedestrian route from Halifax train station to the town centre. Find out more at New Central Library and Archive. The Council awarded the construction work on both projects to GRAHAM Construction following a tender process. The company, which operates throughout the UK and Ireland, has a strong record of working with buildings of historic importance. This entry was posted in Libraries, Piece Hall, Roads and Highways. Bookmark the permalink.